Alright..I lied…a side note…I use fresh squeezed key lime juice in these drinks. Key limes are tiny little limes which are a tad sweeter than run of the mill limes. I have also made this with fresh squeezed lime juice and, although it works, it doesn’t have the smoothness of key limes. Any concentrated lime juice is just simply a no-no!! It is way too strong and bitter!! Whoopsie..lied again…It is imperative to prepare your martini glass and shaker. If I know I will be making drinks in the evening, I will place my martini glasses and shakers in my freezer or deep freeze. You always want your tinis to be ice cold. 1 Oz Simple Syrup~ You can buy a bottle of simple syrup, but it is easier and WAY cheaper just to make it. All that simple syrup is made of is equal parts of granulated sugar and water which is boiled until the sugar melts and then is left to cool down. Easy Peasy and cheap!! 1.5 Oz Heavy Cream~This is basically a liquified whip cream. 1) Do a rimmer of key lime juice and crushed graham cracker crumbs. Return tini glass to freezer. 2) In a chilled shaker that has had ice added, pour all drink ingredients in. Put lid on shaker and shake for 60 seconds to get it nice and blended/chilled. 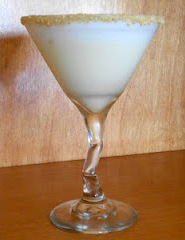 3) Remove glass from freezer and strain drink into tini glass. 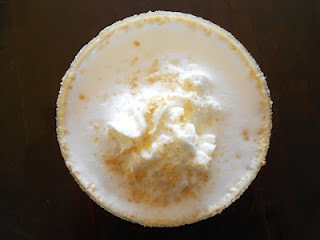 Top with whipped cream and more crushed graham crackers. That is a perfect drink for me! LOL emaginette…that is a PERFECT reason to move! You can use regular limes in the same amount…it is going to have a little bit more of a bite, but it will still be good. Just don’t use a lime concentrate.